One year ago next week, I had a guest post on Wonderland Kitchen, which is now Brighton Park - aka Katie's Place. I shared one of my favorite holiday recipes - Crock Pot Stuffing. It's now time to revive that GLORIOUS recipe just in time for what is possibly my favorite holiday! 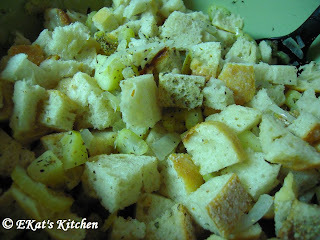 Five Reasons that Crock Pot Stuffing is the BEST way to cook stuffing for Thanksgiving.! 5. No need to deal with the nasty germs that baking your stuffing in a bird engenders. 4. It's easy to please vegetarian guests (swap the chicken stock for vegetable stock). 3. Small kitchen? Single oven? Small oven? Not a problem. Plug and play in a different room. 2. Spend time focusing on your turkey, your guests, or your table settings rather than slaving over a stove. 1. It's easy to make ahead and bring with you to a meal at someone else's home! Additionally, there's one more reason that goes almost unspoken when discussing Thanksgiving... LEFTOVERS! Place bread crumbs in a 6 quart crock pot. In a medium saucepan, melt the butter, and saute the onion, celery and apple until soft. Stir in the spices and then toss over the bread cubes. Stir together well. Pour chicken stock over the mixture and coat evenly. Cook on high for one hour then reduce to low and cook another two to three hours, stirring each hour.